MANAHAWKIN, N.J.— Unionized nurses at Southern Ocean Medical Center (SOMC) were greeted by community members who gathered hundreds of signatures in support of their fight to protect patient safety at their community hospital. “When I read in the news that the nurses, who have cared for my family, were struggling with the hospital administrators to get an agreement to make sure enough nurses are on staff to care for patients I felt I had to do something to help them in their efforts,” said Fran Agostini. ith them, and we will help them to make sure our hospital has enough nurses to care for every patient,” added Agostini. In 2003 SOMC nurses voted to form their union, HPAE Local 5138, which at the time was a standalone community hospital. Since then the hospital has affiliated first with Meridian Health and most recently in 2016 the health system affiliated to form Hackensack Meridian Health, now the largest healthcare corporation in NJ operating hospitals and other healthcare facilities across the state. “As nurses we formed our union to give every nurse a voice in patient care and provide workplace protections. We are grateful for our patients and our community who understand that our first priority is caring for our patients’ safety. Yet, we are bargaining with a large healthcare corporation which has attempted to take away our voice and our rights during our contract negotiations. 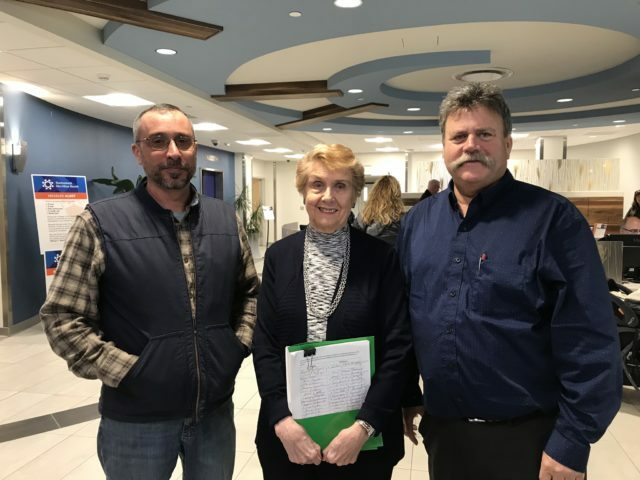 We are encouraged and motivated by the community’s support to continue to stand to speak up for safe staffing levels in our community hospital,” said Barbara Bosch, RN and President of HPAE Local 5138. After an aggressive anti-union campaign during these negotiations, a small group of nurses have petitioned for an election. This vote comes after six months of bargaining with the corporate owners, who have attempted to take away protections the nurses have established in their previous contracts. Voting will take place on Tuesday, November 13 and Wednesday, November 14 at the hospital. The nearly 300 SOMC nurses’ contract expired in July 2018. The union has been at the bargaining table with HMH since June. HPAE simultaneously is bargaining for a new contract for 1,100 nurses of HPAE Local 5058 at Jersey Shore University Medical Center whose contract also expired in July 2018.